This is a unique beer box because it includes hand-selected bottles of quality microbrew alongside the best-imported brands. It's a boxed smorgasbord of elite brews ready to hit the doorstep of someone you love or someone you just want to impress. Whether you're around to share the sweetness, or you're too far away to participate, this is the gift that allows every beer lover to indulge. It's a birthday celebration to remember for years to come, and the cookie is just the icing on the cake. Our son is on the other side is the country at Stanford university, so finding a unique birthday gift was tricky until I found beer gifts.com! It was the perfect gift, well packaged and presented and our son LOVED it! Most definitely will use again! What a cool birthday gift. Wasn't sure when I ordered this if my husband would like it. Boy was I off on this one, he said it was the best gift I had ever got him. Can't wait to order again for him next year. I have sent several gifts to my dad and this was by far the best, he loved it!!! Many beer as wine gift baskets but this was one he really had some many great comments about!! Will order again and again!! I sent this to my daughters boyfriend for a gift and he is really into Beer. He loved it. He kept pulling different things out of the basket, this gift was better than I expected. Sent this to my oldest daughter for her 34th birthday and she LOVED it! It was even nicer in person. I will be ordering here for my other grown children. Great products! Highly recommend this product. 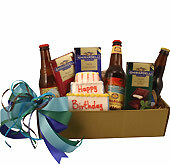 Purchased a beer basket as a birthday gift for family. He loved it- great idea for something different/unique and the price was good. The selection of beers was very impressive from Belgium Germany Mexico Hawaii MI Thank You! Ordered for my brothers birthday and he absolutely loved it ! Nicely packaged and delivery was quick ! The product arrived on time with the correct message and was undamaged=perfect! My brother loved it! Great way to say Happy birthday!